A wild mix of playing styles and personalities characterized Event No. 28, the $5,000 Pot-Limit Omaha with Rebuys event. 152 runners lined up for this one, many of whom came with deep pockets, making the frantic rebuy period a gambler's delight. Things settled down on Day 2, as players carefully combated with their deep stacks, and sometime after 4 a.m. Monday morning, our final nine were set. And what a final nine it was. Our final table featured several poker luminaries, including Johnny Chan, John Juanda, Phil Hellmuth, Daniel Negreanu, and David Benyamine. Of those, Chan emerged at one point as the chip leader, but a couple of damaging hands erased his big stack. Benyamine made the final three, but couldn't overcome a sizable chip deficit, and he, too, fell by the wayside. 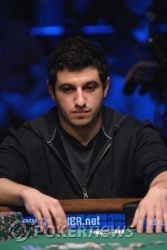 Left standing were online stars Adam "the_houdini" Hourani and Phil "OMGClayAiken" Galfond, both of whom can be found playing high stakes PLO on Full Tilt (along with Benyamine and other big name pros). When heads-up began, Galfond enjoyed a 3-to-2 chip advantange, and while he never lost his lead Hourani proved a worthy adversary, battling for well over one hundred hands before Galfond finally took the last of his chips. When asked afterwards whether he felt intimidated amid so many high profile pros, Galfond replied with a mix of humility and confidence. "I felt blessed to be here, but I didn't feel outmatched," answered Galfond. "I wasn't afraid. I just wanted to play my best game." That he did. 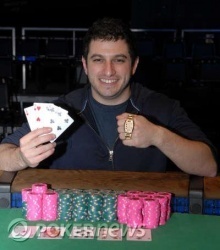 Congratulations to Phil Galfond for capturing his first WSOP bracelet. And thanks to everyone for following the coverage. Hourani raised to 300,000 and Galfond called. Seeing that Hourani had only 125,000 behind, the crowd got on their feet in anticipation of the final all in. The flop was . Galfond set Hourani all in and he called. "Phil is in bad shape here" deadpanned the Tournament Director. However, the turn was the making Galfond two pair and giving him the lead. The river was the and after three and a half hours of heads up play, OMG, we have a champion! Phil Galfond takes home his first WSOP bracelet and $817,781. Adam Hourani is our runner up and earns $493,748. Galfond raised to 300,000 and Hourani called. The flop was . Hourani checked, Galfond bet 500,000, Hourani folded and Galfond won the pot. Galfond raised to 300,000, Hourani moved all in and Galfond called. Galfond raised to 200,000 and Hourani called. The flop was and both players checked. The turn was the . Hourani bet 250,000 and Galfond called. The river was the . Hourani bet 475,000. Galfond paused to take a gulp from his water bottle before going into the tank for several minutes. He finally made the call. Galfond turned up ... no clubs... and won the pot with two pair. And for the first time in what seemed like hours, the crowd went wild. We have just reached the 100th hand of heads up play. Phil Galfond raised 200,000 from the button, and Adam Hourani called. The flop came . Both checked. The turn was the . Hourani bet 300,000. Galfond paused for thirty seconds or so, then made the call. The river was the . Hourani quickly checked. 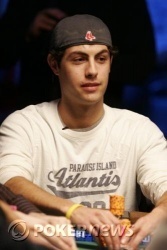 and after riffling his chips for a while Galfond bet 700,000. Hourani shook his head and went into the tank. After about four minutes and a great deal of anguish, he folded.